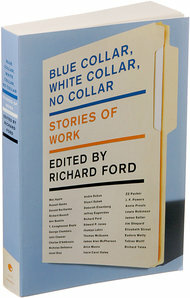 A recent Harvard Business Review article notes that the new Richard Ford-edited Blue Collar, White Collar, No Collar: Stories of Work* conspicuously lacks any tales focused on business-related professions, and instead mostly includes stories about jobs such as writer, editor, and professor (of literature, presumably). According to HBR, the reasons for this, and why most modern fiction doesn't commonly cover the corporate professions, including those in finance, are these: (1) most fiction writers don't work real jobs, and they certainly don't work on Wall Street, or in a big corporation, and thus they have little to no idea what really goes on inside the corporate world; (2) even if they sort of understand what goes on, most fiction writers find corporate jobs too difficult to explain in an interesting, lively manner; and (3) life inside a big corporation is boring as hell so why write about it? HBR also notes that, to hurdle these reasons, it takes a writer as skilled as David Foster Wallace -- who, in his posthumous novel The Pale King, took all three head on and demolished them by (1) taking classes in and performing endless research about tax preparation as well as thoroughly investigating and imagining what it's like to work at the IRS in a sleepy Midwestern outpost; (2) miraculously transforming into poetry the mere mention of "1040s" and "Forms 2440 and 2441"; and (3) documenting the seemingly-mundane to such an extent that it becomes a thing of beauty. And so, while the modern Internal Revenue Service and industry of accounting finally have their novel, the modern world of Wall Street still does not (yes, there have been a couple of valiant efforts of late, such as Adam Haslett's Union Atlantic, which the HBR piece name-checks, but most writers have been taking on Wall Street through the nonfictional route, and no writer has yet to give us the down low and dirty and, perhaps, heroic and high-minded, inner lives of the modern Wall Street banker, trader, salesperson, asset manager, CEO, CFO, COO, etc. ), leaving a gaping hole of an opportunity for some talented young novelist or extremey experienced tale spinner (or, of course, vice-versa) to get Wall Street right.